"Now you can manage and delegate your tasks to your team in minutes - become more productive, get more done and never lose track of your things to do." Use a simple, straightforward software. A1tasks is intuitive - you see a list of things to do and add more or edit the current items on the list. The software is deliberately kept simple so that you spend time doing the tasks, not learning to use the software. Manage a small or big team and want to stay in control. 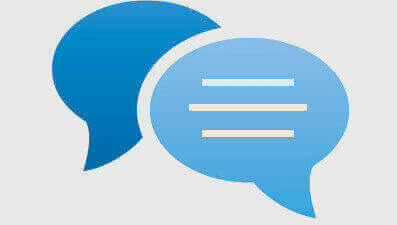 You can delegate different tasks to your team members who can then post questions or progress reports by adding notes. You can also attach files to help them finish the job quickly and properly. Get fully operational in minutes. The system is so easy to use, we want you to ask for a refund if your team members cannot learn to use it in minutes. Need we say more? Use a cheap software that is reliable & fast. A1Tasks does few things and does them really well. We can keep your cost really low and help you get more productive with your day to day work. Make a highly affordable one time investment and enjoy lifetime enhanced productivity. Your investment is a meagre $47 one time - there are no recurring fees. Just download, install and start using it. Create tasks for yourself or assign a task to your team member. 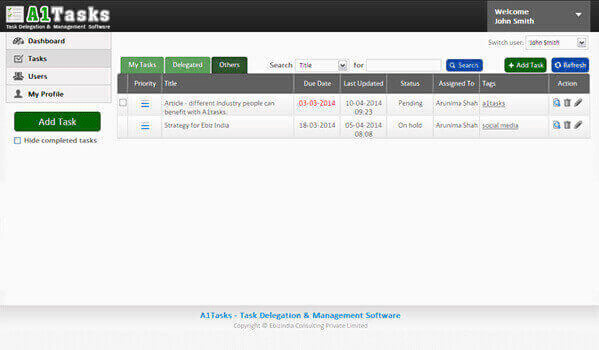 Your own and delegated tasks are shown in separate tabs for ease of management. Attach any number of files to a task - shopping lists, drawings, spreadsheets, pictures - anything that relates to the task. Maintains a complete discussion trail. Both you and your team member can ask clarifying questions and answer these by posting a note. Attach any number of tags to each task. Tag a task with the project it relates to, your department, your client - anything that will help you manage it better. Powerful search and sort operations. Find out all the tasks matching given conditions using search options at the top. Set both the start and due dates and see how much period has passed and due. You can set start dates in future for things that have to be done later. 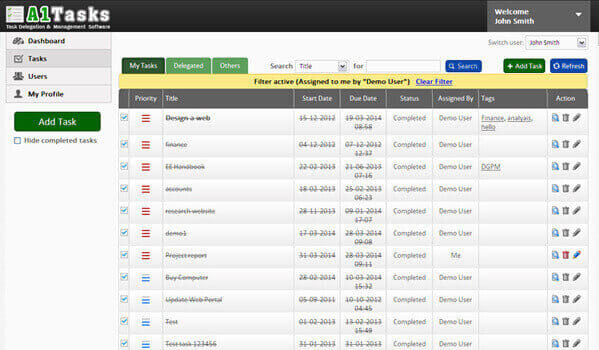 You can see all the tasks related to a tag at any point of time just by clicking the tag on any task. We call it smart filtering. 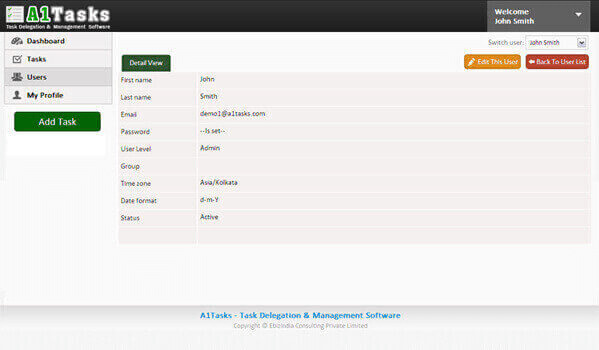 You can also see all the tasks for any person by clicking on the name of the person. 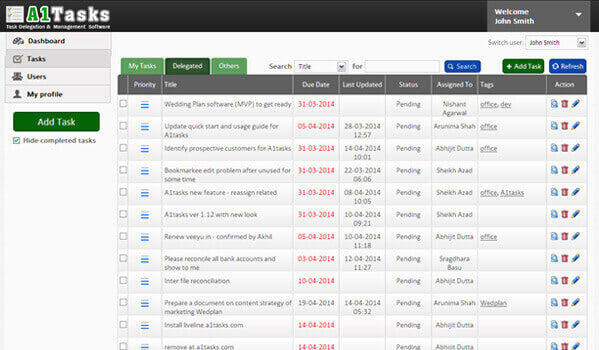 Sort the tasks in any column order for ease of management. Add any number of team members. Mark them as inactive when they leave the team. Each team member can see the date and time in his own time zone and date format. Each task can have high, medium or low priority. Admin can see the stats for all members on the dashboard. 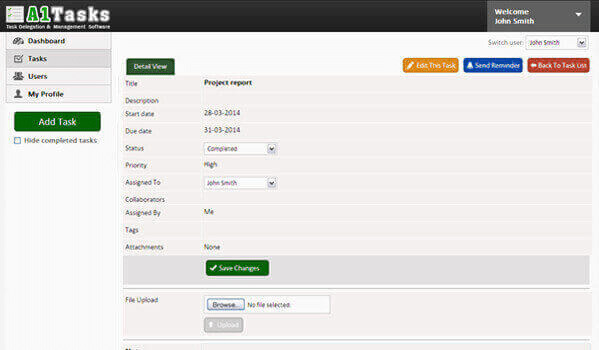 Admin can switch to any user to see his/her tasks for proper follow up in case of absence. 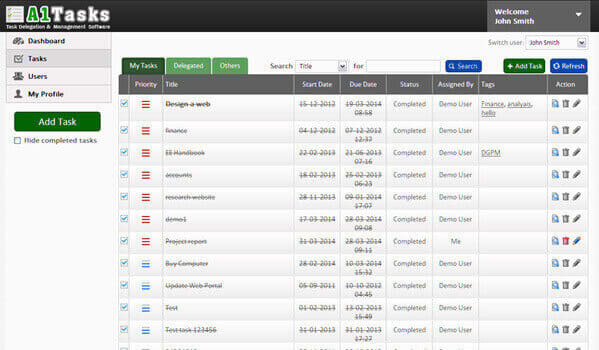 The screenshots below will give you an extensive peek into the working of the system and show you how easy and intuitive it is to manage your tasks with A1Tasks. 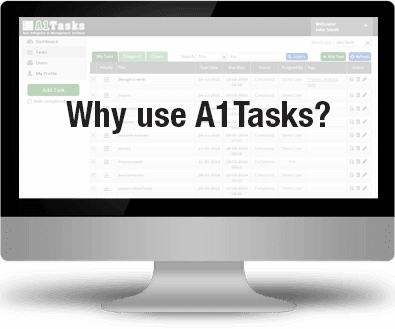 "More efficient and effective task management"
"A1Tasks is simple yet powerful"
A1Tasks is simple yet powerful. The interface is efficient and takes almost zero time to learn. Even without looking at user manual :-) The online filter and speed is exciting too. 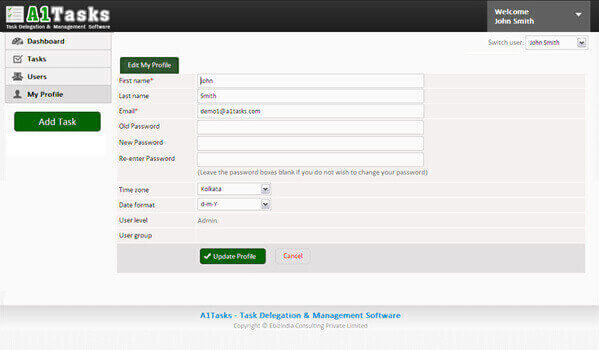 achieve much higher efficiency by using A1Tasks. YES! 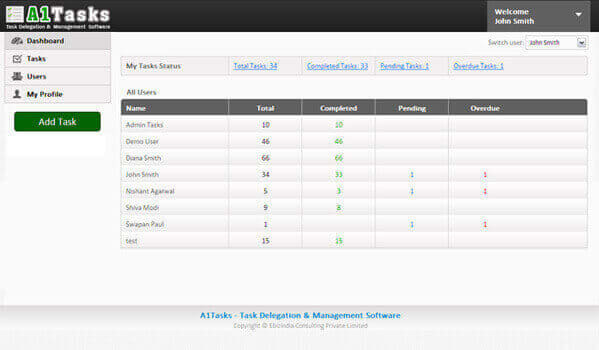 I want the A1Tasks software to streamline my task management and become much more productive. I understand I will be billed $47 today to receive immediate access to the A1Tasks software. 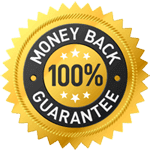 I will also receive free upgrades to the software for a minimum period of 1 year (with no rebills). I can get a complete and courteous refund anytime within the next 60 days with no questions asked whatsoever. Linux server supporting PHP 5 and MySQL. 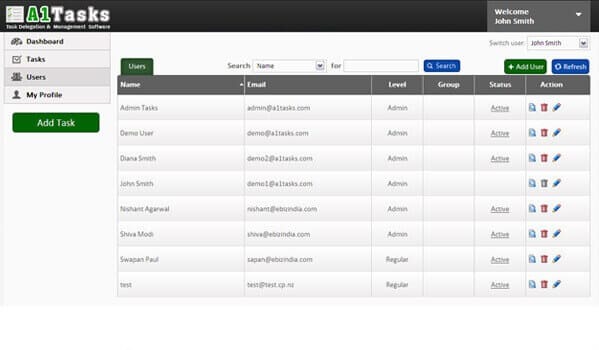 Contact us for a fully hosted software @ just Rs 7,500 per year. Nothing to download or install - just login and start using. 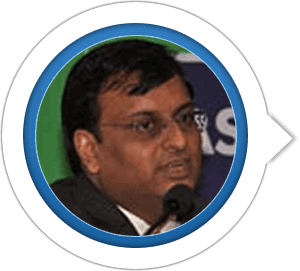 Copyright © 2011-2019 Ebizindia Consulting Private Limited. All Rights Reserved. Website maintained by Webile team. Check out our Online wedding management software.